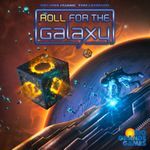 Includes Roll for the Galaxy: Terraforming Colony/Diversified Economy Promo Tile bonus tile. Everything included. I just haven't played my copy in several years.